(182 x 272 mm) 8.3 x 11.7 in. (182 x 272 mm) 11 x 14 in. (304 x 448 mm) 13 x 19 in. MEDIUM 14.2 x 21 in. (360 x 530 mm) 17 x 24 in. Padmasambhava or Padmakara (Tib. Pemajungne), meaning the 'lotus-born', is the principal form of Guru Rinpoche, the 'precious guru' from Oddiyana in Western India, who is credited with establishing Buddhism in Tibet during the eighth century. Because of his miraculous activities he is widely recognized as the 'second Buddha' in all schools of Tibetan Buddhism, particularly within the guruyoga practices of the Nyingma or 'ancient' tradition, where he is regarded as the source of the Mahayoga and Atiyoga or Dzogchen lineages of transmission. He is shown here with his two principal consorts, the Indian princess Mandarava, and his Tibetan consort Yeshe Tsogyal. 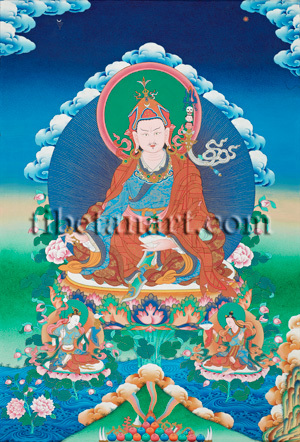 The lake at the bottom of this painting represents Lake Dhanakosha, from whence Padmasambhava was once miraculously born upon an immaculate lotus in the form of a beautiful eight-year-old child. The lotus stem blossoms into a multicoloured lotus of many petals, with its seed-head supporting the cushions of a sun and moon disc, upon which Padmasambhava sits in a posture of royal-ease, with his left leg drawn up and his right leg slightly extended. He is pinkish-white in complexion, with a smiling and slightly wrathful expression, two shining and piercing eyes, an elegant moustache and small goatee beard, and eyebrows that curve upwards like the wings of a garuda. His orange and red 'lotus-hat' has folded upward-pointing flaps on both sides, and a central trefoil crest. The beaded edges of his hat's flaps, crest and headband are coloured dark blue and white, the crest's interior is marked with five directional golden orbs, and above the crest are the symbols of a white crescent moon and a golden sun. The top of his lotus-hat is adorned with small directionally coloured silk valances and billowing silk ribbons, a golden half-vajra, and the crowning emblem of a peacock feather flanked by two vulture feathers. His hat is fastened with red silk ribbons that billow behind his ears, he wears golden earrings and an ornate necklace, and his dark hair hangs freely behind his back. As robes Padmasambhava wears a white undergarment that represents the Mahayana vehicle, a blue robe embroidered with golden dragon and phoenix designs that represents the Mantrayana vehicle, and a patched and embroidered orange robe that represents the monastic pratimoksha vows and vehicle of moral discipline. Outside of these three robes he wears a heavy embroidered red cloak that represents his perfection of all vehicles or paths to enlightenment. He also wears a 'cloud-collar' of multicoloured silks, an orange belt, and felt shoes that are ornamented with gold. With his right hand resting upon his knee he holds a golden five-pointed vajra, while his left hand rests upon his lap in meditative equipoise as he supports a skull-cup filled with the nectar of immortal wisdom. Within this blue nectar appears a golden long-life vase, the top of which is sealed by a small red lotus with leaves - a symbol of Amitabha Buddha, of whom Padmasambhava is an emanation. In the crook of his left arm he supports the shaft of his tantric staff or khatvanga, which is adorned at its top with a crossed-vajra, a nectar-filled vase, three impaled heads, and an iron trident adorned with small iron rings and a blazing central prong. The three heads represent the 'three kayas' and consist of a freshly severed head (nirmanakaya), a decaying head (sambhogakaya), and a dry white skull (dharmakaya). A billowing white silk ribbon is tied around the neck of the khatvanga's long-life vase, and from its base hangs a golden thread that supports a small hand-drum or damaru, a silver bell, and the conjunct emblems of a crescent moon and sun. Golden light rays scintillate against his dark blue aura, which is encircled by flowers, leaves and blue clouds. Seated upon a leafy lotus and moon disc to Padmasambhava's right (lower left on painting) is his Indian consort Mandarava, who wears the lower silk robes and upper bodice of an Indian princess. She is peaceful, youthful and white in complexion, and with her right hand she holds a silken divination arrow with a silver mirror fastened beneath its flight. The palm of her left hand is covered with a blue silk cloth as she supports a golden longevity vase crowned by a nectar-filled white conch shell. On a similar lotus to Padmasambhava's left is Yeshe Tsogyal, who wears the silk garments of a Tibetan princess. She is likewise peaceful, youthful and white in complexion, and wears a small golden mirror on the front of her tiara. With her left hand she makes the abhaya-mudra of protection, while the palm of her right hand is covered with a red silk cloth as she supports a skull-cup filled with the blue nectar of immortal wisdom. Jewel offerings and the seven insignia of the 'universal monarch' or chakravartin appear on the hill at the bottom centre, with three beams of rainbow light emanation from the radiant blue wish-granting gem that crowns the stacked offerings.